I love the novel Shane, by Jack Schaefer. That it has not made it among the canon of literary works for junior high and high school students is a travesty. Its charming story of a boy’s worship for his hero, its moving depiction of a steadfast friendship, its portrayal of men of unsullied, resolute, strong-willed character, make it a literary masterpiece ideal for young women and men. Shane tells the story of a mysterious cowboy who rides into a town torn by conflict between cattle rangers and homesteaders battling for the survival of their way of life. Though clearly trying to escape his violent past, Shane defies cattle baron Fletcher and his band of gunslingers when they threaten the homesteading Starretts, to whom he has become guardian, hero, and friend. One of my favorite things about this novel is that between its covers, Shanecreates a universe that is distinctly, dazzlingly clear. Everything is meaningful. And that meaning is conveyed with economy, precision, and unpretentious beauty. I am currently teaching this novel to the 8th graders at VanDamme Academy. This week, we did a fun exercise meant to emphasize this very point, that Shaneis a finely-crafted work of art in which every line is purposeful. I asked the students to do the following: Close your eyes and point at random to a line from the first chapter. Then examine whether that line is important to establishing something fundamental to the novel’s plot, characterization, or overall meaning. The first of the randomly-selected lines was, “But his voice was gentle and he spoke like a man schooled in patience.” This was easy. Shane’s “gentleness” is central to the puzzling nature of his character. He is introduced to us as a man of seeming contradiction: ever alert and tense, yet with a simultaneous relaxed easiness; “dangerous,” yet the safest man the Starretts ever had in their house; cold and terrifying, yet mannered and gentle. 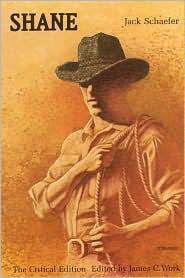 The next line selected was, “He shook his hands dry and used the handkerchief to remove the last drops from his face.” This line, and those surrounding it, established the strangely proud, mannered, and dignified demeanor of this rough-and-ready cowboy. Though riding the hot and dusty range, he maintains a polished appearance, wearing clothes of fine materials, wiping the dust from his boots, scrubbing the dirt from his hands and face, and even taking care to remove the last drops of water. The goal of this exercise was to heighten the students’ enjoyment of the novel. I hope it will help them to soak in every line, to take pleasure in the exactness and the eloquence of Schaefer’s language, and to enjoy their time in a world so purposeful, lucid, and brightly lit. They will have many such experiences in the course of their education here, which will have the effect of giving them a light of their own to shine on their lives and on the world around them.